Engelbert frowned, trying to understand why Pamela had been acting strangely. Her programming skills were among the best in the company. She had a way of getting things completed. That’s why he made her project lead for Uberdenke’s next UDCRM product release. With only two weeks left until the ship date, Pamela’s personality had shifted. Normally calm and composed, she had been seen crying after meetings. Occasionally he could hear her screaming at the programmers working for her. Something had to be done. He was going to have to figure out what was wrong with Pamela. And fix it. 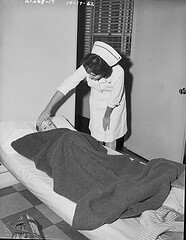 Engelbert’s decision casts Pamela as an “Identified Patient.” The Identified Patient becomes the focal point for the Engelbert’s intervention work to “solve the problem”. When Pamela is “cured”, Engelbert thinks, he can return to his normal schedule. Until then, he has more important work to do. What happens when Engelbert becomes involved with the Identified Patient Pattern? And is Pamela’s behavior change really the problem? Could there be a fundamental problem that Engelbert is overlooking? What effect does Pamela’s behavior have on the project? Extra work gets created (trying to “cure” Pamela) and time gets spent doing non-productive tasks (appeasing Pamela, hiding, gossiping). The less useful work gets done. 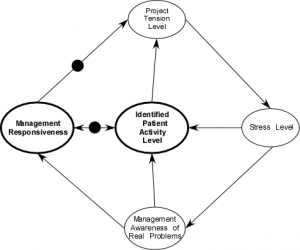 This diagram shows the downstream effects these actions cause. Eventually these actions adversely impact Remaining Work, which increases Deadline Pressure, which increases Identified Patient Activity Level. And the dynamic starts over again with amplification due to the prior looping. The loops are all negative feedback loops. This means once Pamela (or anyone) becomes the Identified Patient, the system starts down hill, and continues until it hits a natural limit and stabilizes or collapses. Without knowing it, Engelbert and the UDCRM team become embroiled in activities that add more pressure to system, thereby creating more Identified Patient Activity Level on Pamela’s part. By trying to “cure” Pamela, Engelbert engages in treating the symptom, not fixing the problem. In this case, Deadline Pressure continues to build, creating more stress and exacerbating the Identified Patient Activity Level. What does Pamela’s worldview look like? She’s the project lead for the next release of UDCRM. The project started with a bad release date (see “The Liar’s Contest”). Engelbert knows this (“No Exit). The project team can look at the remaining work and see they won’t make the ship date. Uberdenke has to two intertwined systems: the formal hierarchical system with nice boxes and lines, and the informal “shadow” system formed by acquaintances, friends, antagonists, history, and working relationships. The intertwined systems can be congruent or incongruent. When the systems are incongruent, the informal system struggles to compensate–not always effectively–as long as possible. When the informal system can no longer compensate, it doesn’t degrade slowly, it collapses. As project lead Pamela embodies the stress and manifests it via her behavior. As her stress level goes up, her behavior becomes more erratic. As her behavior becomes more erratic, the less remaining work gets finished (see above figure), which increases the project tension and so on. When Engelbert starts trying to “cure” Pamela, two problems occur. First, the Identified Patient dynamic starts, engaging the negative feedback loops. Second, Engelbert’s attention becomes focused on Pamela, and misses the opportunity to look for a fundamental problem. Trying to “cure” Pamela may momentarily reduce pain, but–because the real problems are not being addressed–this ultimately leads to system collapse and much more pain. 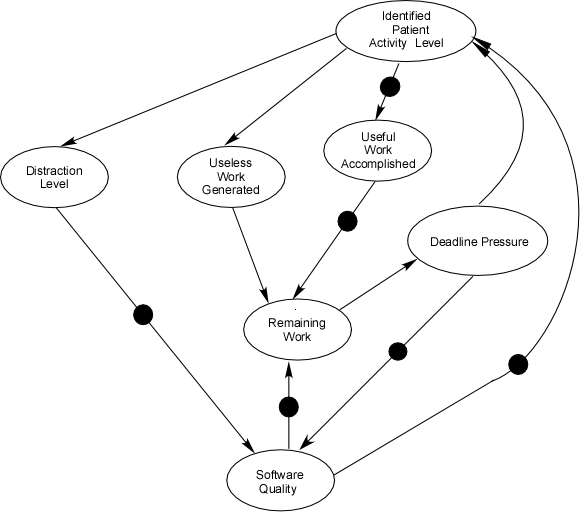 Combining Pamela’s stress and Engelbert’s actions results in the following diagram. Both loops keep on keeping on, resulting in more of what we already have. This results from the Identified Patient’s second order nature. Second order nature doesn’t mean the tension and stress aren’t real. It means some other problem causes this problem. Trying to cure an Identified Patient is like scratching athlete’s foot. You’re doing something that feels good, but when you quit scratching you still have athlete’s foot, and wounds from the scratching, which has also spread the fungus more widely. 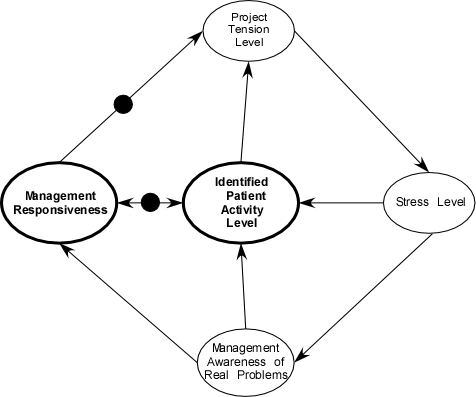 To improve the situation, Engelbert needs to move from the negative reinforcing loop to the Tension/Stress/Awareness/Responsiveness balancing loop. Something in the formal system doesn’t want to know what the informal system knows. Pamela’s behavior masks the real problem. Engelbert may not have the interpersonal skills needed for this. I don’t want to hear problems, I want hear solutions. Our competitor can do this, why can’t we? You’ll just have to work smarter. If you can’t do this, I’ll find someone who can. Triangulation (compensating and covering for a fellow employee). Most software development managers made it there by having great technical skills, not great people skills. If Engelbert discovers the problem isn’t work related, he’ll need help. Dealing with personal problems in a work environment can be a legal minefield, and is best left to people trained to do it. In the extreme case, Engelbert may choose to blame Pamela for the project’s problems. While incongruent and counterproductive in the long term, this tack appears to have short-term benefits. Pamela becomes the scapegoat, and hopefully the problems will leave when she does. In the mean time, a new delivery date will be set (while in panic mode). This temporarily relieves the Deadline Pressure. This dynamic may execute several times, until eventually some new delivery date finally provides the time necessary to complete the project. Or, the project collapses under all this extra effort and emotion. Identified Patients exist everywhere. The tip-off comes when you hear or think, “Things would be better if this person would just leave.” In reality, that person leaving won’t change the underlying system, and someone else will take on the role. The key to success starts with understanding the Identified Patient functions like a canary in a mine. They provide an early indication something is wrong and needs to be dealt with, but replacing the dead canary will not clean the toxins out of the air. Unfortunately, unlike the canary whose death tells the miners that the air is probably poisonous, the Identified Patient doesn’t indicate what problem exists. One thing for Engelbert to consider: the closer he gets to finding the real problem, the more Pamela may act out. One of Engelbert’s options involves getting the UDCRM team to focus on the remaining work, thereby reducing the attention given to the Identified Patient Activity Level. This becomes an exercise in active support and barrier removal, not platitudes and posters about success through working harder. If the Identified Patient Activity Level gets even larger, this indicates that something else is going on. Adding tools leads to the “worse before better” dynamic as productivity drops while people get used to the new tools. Splitting tasks leads to the communications/interface dynamic where information needs to flow through more paths and permutes while doing so. Splitting people between tasks leads to context swapping overhead, that period of time it takes to remember where you were and get back into the flow. Adding new people to the project basically incorporates all the above dynamics. 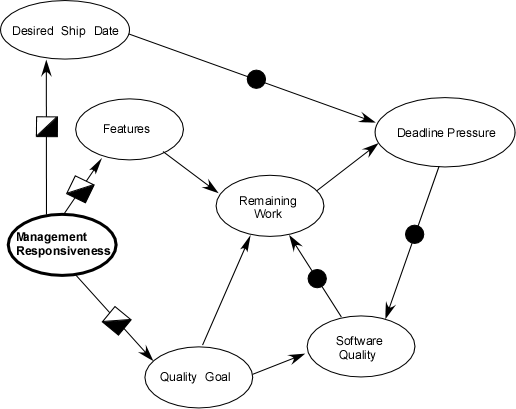 Features – If the number of features decreases, the Remaining Work decreases, which decreases Deadline Pressure. 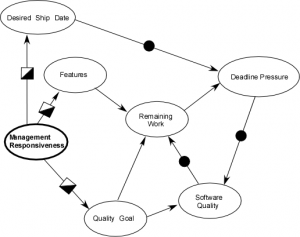 Quality Goal – If the acceptable quality is reduced, the Remaining Work reduces, which reduces Deadline Pressure. Desired Ship Date – As the Desired Ship Date gets bigger (more days to ship), Deadline Pressure goes down. At this level we now have balancing feedback loops that help stabilize the system. Selecting the best leverage point or combination involves determining how the Uberdenke clients can best be served. Compensating for other people in the system. Really bad managers using blame to cope with bad results from poor decisions. Identified Patient behavior is a symptom, not a cause. 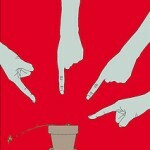 If management does recognize the behavior, they’ll most likely try to fix you, not the cause. Unless you want to be “fixed”, it’s important to recognize the source of your incongruent behavior. This enables you to work on becoming more congruent and changing the source of the Identified Patient behavior. If you’re bored, change yourself. Try and find a more challenging position in the company. Take up a hobby that will provide the challenge you’re looking for. If necessary, consider changing companies. Get interested in solving some real problem that’s hindering others. Triangulating due to incongruent systems doesn’t accomplish anything. The systems eventually align when the informal system collapses and the formal system has no choice. This usually happens too late to do meaningful risk management and damage control. Much pain accompanies the collapse. Trying to alert the formal system to impending doom may get you labeled as “Nay-sayer”, “Not a team player” and such. If this happens, consider changing companies. While a nice concept for those taught to “play nice with the other kids”, triangulating by covering for other people boomerangs at two levels. 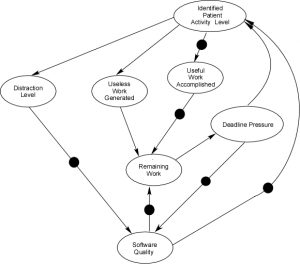 You’re not going to be able to do the work for two people, the amount of remaining work will go up, leading to deadline stress, and the incongruent systems dynamic comes into play. Along the way, you’ll become exhausted and your health, both mentally and physically will deteriorate. This reduces your ability to produce and the cycle starts over again. It’s OK to occasionally help other people. But if helping other people gets in the way of getting your job done, learn to say no, or find another company to work for. Whatever you do, do it directly. There’s enough confusion without adding triangles to the mix. Lastly, if you can’t change the system, and changing companies isn’t an option (and sometimes it isn’t), recognizing the dynamics that create the Identified Patient behavior can help you cope as congruently as possible. Identified Patients indicate something is wrong. Trying to “cure” Identified Patients seems important, but lowers the amount of useful work accomplished. Locating and correcting the fundamental problem is the best way to “cure” the Identified Patient. Engelbert needs to remember that correcting the fundamental problem may temporarily cause other problems.